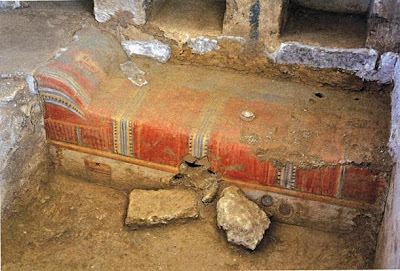 A well-preserved and ornately decorated underground Roman tomb, complete with vaults and wall paintings, was found in Corinth during works to extend the Corinth-Patras national road, archaeologists said on Wednesday. The find came to light a bit more than a year after the revealing of another ornate Roman tomb in the same location. Measuring 3.30m by 2.63m., the tomb has been initially dated to between the 1st and 2nd centuries AD, but may be earlier. It was entered from the south through a staircase decorated on either side with two ceramic tiles in deep relief, one showing a quadriga (four-horse chariot), and the other depicting a chariot pulled by dolphins next to a sea creature. Inside, there were vaults over niches where ash urns were placed, and three larnaces (terracotta coffins) containing bones, oil lamps, bronze coins and pottery shards. One of the coffins was painted to depict bed covers. 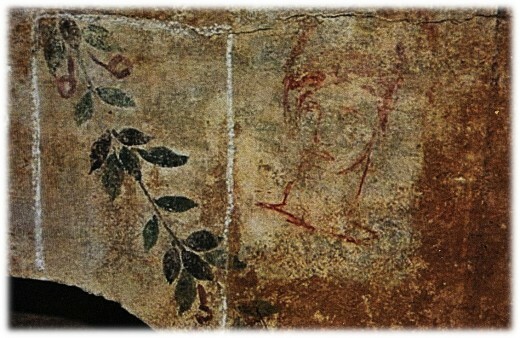 The interior of the tomb also contained very well-preserved wall paintings, depicting garlants, fruit and three figures, two men and a woman. According to the Central Archaeological Council of Greece, the tomb belongs to the same Roman cemetery overlying an Archaic one that had yielded a similar ornately decorated tomb in 2012. 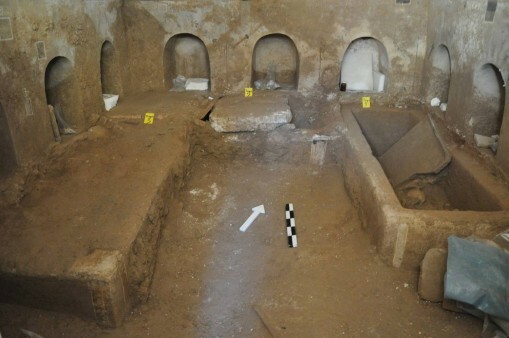 The ancient cemetery has yielded other artefacts of importance, such as troughs for offerings between burials, which have so far only been found at the Kerameikos ancient cemetery in Athens. Archaeologist Anna Karapanagiotou, Council member, said that the tomb “may possibly be that of a Roman citizen, possibly an official or Romanized Greek, who had a close relationship to Rome.”The richness of the finds at the site prompted the Central Archaeological Council to set up a seven-member committee to conduct an on-site inspection, which will also help in the decision to keep the monument in place or remove it.